While production on Avengers 4 will carry over into the new year, we reported last week that Paul Bettany has wrapped on the movie. Now it seems that another integral part of the production has wrapped. Heidi Moneymaker, who is Scarlett Johansson's stunt double on the set, shared an Instagram photo earlier this week that revealed she has also wrapped. But the photo may have teased something else as well. 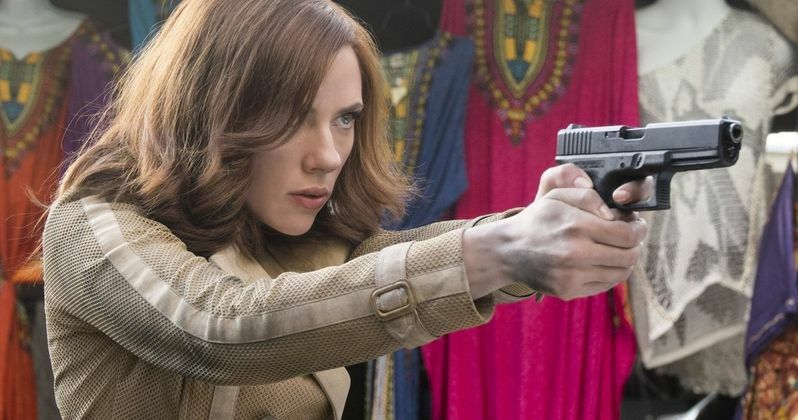 The image in question features Scarlett Johansson wearing a very familiar outfit, which strangling flash back to the events of Captain America: Civil War. While there is no clear-cut confirmation that this flashback is taking place, Scarlett Johansson is seen wearing the same tan coat from the opening scenes of Captain America: Civil War, and her hairstyle is the same as it was in that scene as well. The scene in question was an epic fight in Lagos, which involved the new Avengers that had assembled for the first time at the end of Avengers: Age of Ultron, who try to contain the villainous Crossbones (Frank Grillo) as he attacks an infectious disease center. While there is still no confirmation that Avengers 4 will feature a flashback to this scene, there have been other pivotal scenes in the MCU that have been teased thus far. There have been indications that Avengers 4 will also revisit the iconic moment in Marvel's The Avengers where the Avengers assemble before the Battle of New York, but how this scene is revisited is still uncertain. While it could be as simple as a flashback scene, there is also the possibility of time travel, made possible by the Time Stone that was revealed through the Eye of Agamotto from Doctor Strange. There have already been indications that the Sanctum Sanctorum will be featured in Avengers: Infinity War, so it's possible that these pivotal scenes from MCU history could be revisited through time travel. Regardless, Scarlet Johansson revisiting this very coat and hairstyle is intriguing, nonetheless. This also comes more than a month after a separate rumor surfaced teasing Crossbones is coming back in Avengers 4. In early November, Robert Downey Jr. and a number of Avengers stars converged on a local Atlanta theater for a one-night-only production of the iconic play Our Town. The Our Town cast photo surprisingly included Frank Grillo, which many fans took to mean that the Crossbones character will return, somehow. While the character was seemingly killed in that epic opening scene of Captain America: Civil War, this new photo teasing Scarlett Johansson's coat and hairstyle from Captain America: Civil War could also help clarify rumors of Frank Grillo's possible return as Crossbones. There was also a report from October that revealed Iron Man 3 star Tye Sheridan may return as Harley Kenner from that sequel, which could indicate that there may be more time travel scenes, or it could also mean we may see what Harley Kenner has been up to in present day. Regardless, very little is known about the story, and since the title for Avengers 4 is considered a huge spoiler for Avengers: Infinity War, we likely won't find out the title until after Avengers: Infinity War hits theaters on May 4, 2018. While we wait for more details on Avengers 4, take a look at the latest photo from the set, courtesy of Heidi Moneymaker Instagram.